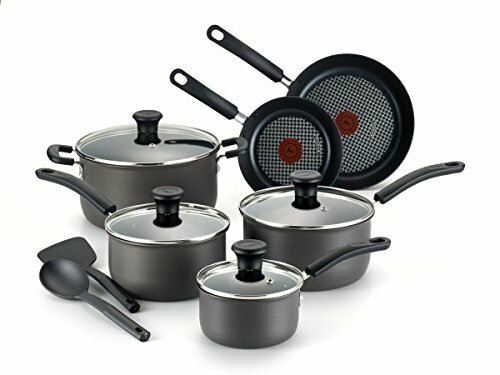 The T-Fal Signature Hard Anodized 12 cookware piece set comes with useful cookware pieces including a dutch oven, three saucepans and two sauté pans. The set also includes two utensils – a spoon and pancake turner/spatula. T-Fal Signature cookware offers a superior non-stick surface which makes cooking easy and cleaning up even easier. The hard anodized exterior surface ensures that the set will last a long time by protecting against damage. Probably one of the nicest things about this set is the price. For a starter set or for someone who is a casual home cook, the T-Fal Signature Hard Anodized 12 cookware piece set makes a nice one, as it can be purchased for less than $100. Non-stick interior for easy cooking and easy clean up. The exterior surfaces of the T-Fal Signature Hard Anodized 12 cookware piece set are made of hard anodized aluminum. Hard anodized cookware is pieces of aluminum that have been chemically treated to alter the composition of the metal. Following this treatment, the surface is tough and durable, and resistant to damage such as dents, dings and scratches. Because aluminum is a great conductor of heat, it makes a great base metal for non-stick cookware. It heats up quickly and evenly, which helps prevent hot spots when cooking that can lead to burnt food. The T-Fal Signature pieces are dark gray in color, with black soft touch handles that are riveted to the pieces. The lids also have dark, black handles and made of see-through glass. Each of the handles has a loop at the end, so it is possible to hang the pots and pans from a kitchen rack. As far as how the set “feels”, reviewers overwhelmingly stated that the set is lightweight. This can, of course, be a positive or negative, depending on your personal preference. This is one of the unique features you’re sure to immediately notice on the T-Fal Signature Hard Anodized 12 cookware piece set. In the center of the cookware pieces is a heat indicator that will let you know when your pot or pan has reached the perfect temperature for cooking. 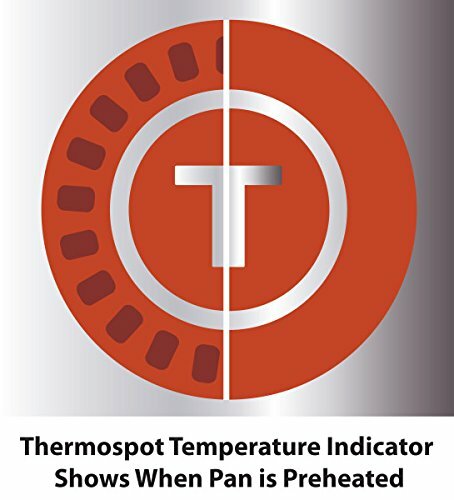 Whenever you preheat your pans, the Thermo-Spot pattern will disappear and turn to a solid red color when it has reached the proper temperature. Why is this important? Cooking at the optimal temperature ensures that you are sealing in the flavor and natural juices of your meats. In addition, cooking at the correct temperature is the key to perfectly cooking almost any food quickly and easily. One of the nice features included with the T-Fal Signature Hard Anodized Set is that the handles are a soft material, and they are a bit larger than normal pot handles. This makes them comfortable to hold and move about while cooking. The handles seem to stay relatively cool during use, though caution should be used when using the pieces in the oven. The T-Fal Signature Hard Anodized 12 cookware piece set is oven safe up to 350° F.
T-Fal warrants the set against defects and offers a limited lifetime warranty on this set. Hard anodized aluminum is one of the toughest – and affordable – metals you can find in cookware. Properly cared for, you can expect your T-Fal set to last for many years. While the manufacturer states that it is safe to use metal utensils with this set, I really advise against it (as always). Why take the risk when there are safer plastic and silicone utensils that can be purchased in nearly any grocery, discount or department store? Customer reviews seemed to back the idea that this set will last a long time. One reviewer had been using the set for over a year and reported that they are still “good as the first day”. Another reviewer said she was replacing a set that was 10 years old. You’ll really want to hand wash this set for best results and the longest useful life. I know, I sound like a broken record. It really is true, though. Particularly with non-stick pans, I think it’s important to take the time to hand wash. Placing pans like this in the dishwasher exposes them to harsh chemical detergents and also the risk that something will scrape or bump up against them. With the excellent non-stick surface, you shouldn’t find these difficult to clean at all. This set has fantastic reviews all around the internet, including reviews at Amazon, K-Mart, Wayfair and Hayneedle. Reviewers were pleased with the even heat distribution of the pots and pans. The pans also heat up quickly. The pans are truly non-stick and there were no complaints of food sticking to them. In fact, over and over, the reviews stated how easy the set is to clean. Several consumers were purchasing this set to replace an older set of T-Fal cookware. A few mentioned that they had been using their set for years – one for more than 10 years. This just goes to show the quality of the entire T-Fal line, and that the cookware appears to be extremely durable. Quite a few people did mention that they had used metal utensils and ended up scratching the surface. While one reviewer mentioned that she had no problem using metal utensils, the experiences of others would confirm my feeling that only soft material utensils should be used. One of the drawbacks to the set seems to be with the sizes of the pans. For light cooking, or cooking only for a couple of people, the T-Fal Signature Hard Anodized 12 cookware piece set seems to work just fine. However, some consumers with larger families said that the sizes just aren’t big enough when cooking larger portions, as would be needed with a larger family. While this really doesn’t have anything to do with the quality of the cookware, it’s certainly something you’re going to want to take into consideration when choosing a set. Overall, T-Fal Signature Hard Anodized 12 cookware piece set seems to be a great cookware set that many consumers have been thrilled with. Honestly, for the price, you really can’t go wrong with this set. While I didn’t see it listed anywhere for more than $100, I did find the best price to be at Amazon.com. At the time of this writing, the set was less than $80.